Appearance: Very tall, bald and muscular. Right arm lost at the shoulder, replaced by a pincer. Nick-named because of his wicked laugh, Tee Hee is a towering and domineering figure with a deep voice. He is right-hand man to Dr. Kananga (aka Mr. Big). Tee Hee is loyal to his boss and thorough at his job. He oversees the refining of Kananga's heroin, ready for distribution on the streets of New York. Tee Hee also assists Kananga with the more sinister aspects of his operation, taking great pleasure in torturing his victims with his pincer. He lost is arm to the crocodile, Old Albert, at his farm in New Orleans. Tee Hee is often seen in crisp cut suits and aviator sun glasses. "...Just stick your hand in its mouth and pull out all its teeth." Tee Hee first runs into James Bond when he has a nasty turn in a booth at the Fillet of Soul club. Tee Hee promptly disarms the secret agent by wrenching the barrel of Bond's gun. The pair come face to face at the New Orleans branch of the Fillet of Soul and Tee Hee is on the verge of snipping 007's little finger. Spared for the moment by Kananga seconds before its too late, Tee Hee is tasked with taking Bond to the crocodile farm and disposing with him that way, but fails. When his boss meets with an explosive end, Tee Hee tries to reap revenge aboard the train Bond and Solitare are traveling aboard. 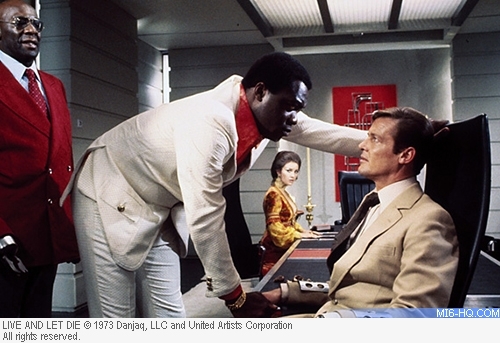 Bond and the henchman fight it out, with 007 finally disarming Tee Hee. Bond managed to overpower Tee Hee by cutting a cable inside his mechanical hand to lock it to the windows before throwing him out of the train. Born in Philadelphia, Pennsylvania in 1923, Julius W Harris, his mother was a cabaret dancer and his father was a musician in the clubs - notably the Cotton Club in Harlem. He served in the army medical squad during the Second World War and by 1950 he left the army, but continued to work in the medical profession. Harris used to frequent the Greenwich Village Bar in New York City, where he would drink with prestigious film stars including James Earl Jones, Louis Gossett, Jr and Yaphet Kotto. "I was going meet Guy Hamilton. At the meeting he said to me. "What kind of a weapon would you like to have in the movie?" "I knew there at the time that I had it. I used so many guns, so many knifes so why don't you give me something unusual like a hook." It was not until age 41 that Harris took a plunge and auditioned for and won a role in the 1964 "Nothing But A Man", an acclaimed drama directed by Michael Roemer. He went on to find roles in Dionne Warwick's "Slaves" and "Shaft's Big Score!" (1972), starring Richard Roundtree as John Shaft. He played Big opposite Robert Hooks and Paul Winfield in "Trouble Man" and "Black Caesar" (1973), which stars Harris' Bond co-star Gloria Hendry, before his run-in with James Bond. His early career saw Harris star in some low budget flicks, but in the space of eight years as an actor he had made a name for himself. 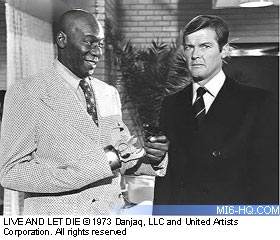 "Live And Let Die" saw Julius Harris co-star with Roger Moore and his old friend from the Greenwich Bar, Yaphet Kotto, who was signed on to play the lead villain Dr. Kananga. Harris reportedly suggested the Tee Hee hook to the producers, and had this villain's distinguishing feature written in to the story. He performed all of the train fight finale without a stunt double. 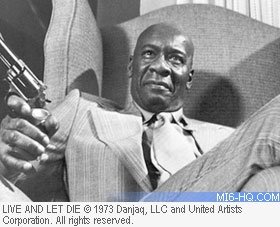 Beyond Bond, Harris had a booming career in both American films and television, notably "Hell Up in Harlem" (1973) starring Fred Williamson and "Die" co-star Gloria Hendry. In 1978 he appeared with Bond girl Britt Ekland in the true-story of boxer Joe Louis, "Ring of Passion". 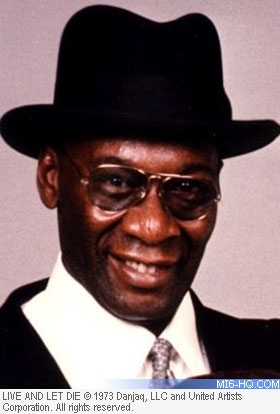 During the 1980s and 1990s, Harris had a full career, appearing in a throng of films and television, including "Chauffer" (1986), "Darkman" (1990) and "Harley Davidson And The Marlboro Man" (1991) and his last film was 1994's "Shrunken Heads". "This is the part I like best: feeding time." Throughout his career Julius Harris helped break down the race relation barriers on television and in cinema. On Sunday October 17, 2004 Harris passed away in Los Angeles, California; he was 81. He is survived by two children, Kimberly and Gideon.